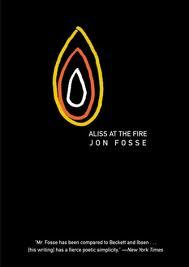 Jon Fosse’s Aliss at the Fire (originally published in Norway in 2004) is a dream in which language and time circle around an old house by the edge of a fjord. Signe is still trying to understand the meaning of her husband’s death twenty-three years earlier, when, on a dreary November day, Asle inexplicably took his small boat out on the water and only the boat eventually returned to shore. Who is the “I” that watches Signe? Signe lives alone, in total isolation in a remote place. The word “I” never reappears and we never learn with certainty who it is. Instead, the novel carries on for a while through the perspective of Signe, until nearly thirty pages into the book when the narrative is handed off to the perspective of Asle, her dead husband. For extended periods we seem to inhabit Asle’s mind as he envisions family scenes that span several generations before him and as he debates whether or not to row on the fjord in such inclement weather. Asle remembers hearing about his great great grandmother Aliss, who lived in the same house, and he remembers learning that he was named after another Asle, who, two generations earlier, drowned in the fjord on his seventh birthday, pursuing a toy boat that had drifted out into deep water. One moment we are watching Asle watching relatives that he never met, the next moment we watch the same scene continue on uninterrupted from the perspective of Signe, who finishes the description exactly where Asle left off. The central image of Aliss at a fire is a vision that Asle has of his great great grandmother Aliss and her young son Kristoffer tending a fire in which she is burning the wool off several sheep’s heads (presumably before cooking them). Asle “recalls” the scene at some length; in fact, it’s the most deeply described scene in the book, hitting all five senses as Asle lingers over this mysterious event. I was hard pressed to understand the importance of this scene until its end, when Kristoffer, who seems to be a toddler, makes a dash for a boat moored at the end of the nearby dock and falls into the fjord. Through quick thinking, Aliss saves Kristoffer from the fate that claimed the two Asles. This is just one of many scenes in which Fosse blurs the boundaries between memory and visions. Signe and Asle both use the language of memory to describe events they did not participate in and people they never met. If nothing else, it makes for a haunting narrative device that allows Fosse to move the story forward with great economy. But let’s circle back for a moment to the curious and unique “I” on page one. There are three logical choices: Fosse himself, Signe’s husband Asle, or Asle’s great great grandmother Aliss. I would rule out Fosse, since he doesn’t seem interested in post-modern authorship games. That leaves us with the probability that the real narrator of Aliss at the Fire is dead. Earlier, I wrote about Fosse’s 1995 novel Melancholy, which, like Aliss, was translated by Damion Searls and published by the Dalkey Archive Press). And I have to think about seagulls. I have to not think about what Doctor Sandberg said, I have to take my hand away. I have to be allowed to paint again, I have to be allowed to paint clouds again, trees and poplars, big mountains. Because I am a painter, I am the landscape painter Lars Hertervig, a student of Hans Gude himself, trained at the Academy of Art in Düsseldorf. I am an artist, a painter. I am Lars Hertervig the painter. I have to not touch myself down between my legs. I have to think about seagulls. It’s the 1850s. Hertervig feels he can no longer face the critique of his painting instructor and he has fallen madly in love with the fifteen-year old daughter of his German landlady, raising the suspicions of the girl’s uncle, who evicts him. Hertervig also happens to be delusional, insecure, sexually frustrated, and paranoid. In short, his entire relationship with the world has become undone. He can describe his actions and those of the few people with whom he interacts, but he can’t make much sense of it all. Ultimately, he is committed to an insane asylum where we spend a day in his company. Melancholy is the first of Jon Fosse’s many novels to be translated from Norwegian into English, and for obvious stylistic and metaphysical reasons it’s not surprising that the publisher (Dalkey Archive) wants to position him in the lineage of Samuel Beckett and Thomas Bernhard. Fosse has taken a huge risk to trap us in the mind of a man so unpleasant and seemingly unrewarding. This is how I imagine death by quicksand would feel – slow and suffocating. Nevertheless, with admirable resolve Fosse remains strictly within the boundaries of his narrator’s limited and largely uncomprehending mind as he sinks further into madness. Hertervig’s mind has latched onto repetition as a means of trying to stay methodically, but futilely, in control of himself. The result is a tour de force of writing that can make for periods of slow reading. The only times when Hertervig’s mind goes free are frightening hallucinatory moments when past and present blend in remarkable verbal collages of stunning, quickly tumbling images. And the snow is white and powdery. I see the snow shovels of Helge and the others moving the whole time, down into the snow, then the snow shovels move up, then the snow falls off the snow shovels, then the snow shovels move down into the snow again and again the snow shovels move up. Then, after two hundred and fifty pages, Melancholy becomes something entirely different. Fosse adds what amounts to a thirty-page coda at the end. It’s now 1991 and Vidme, an author hobbled by a sudden inability to write, is trying to start a novel about Hertervig, whose paintings have moved him deeply. For reasons he himself does not understand, he has arranged to visit a pastor of the Norwegian Church – perhaps to express an interest in joining the church, perhaps not. The pastor turns out to be newly appointed, young, female, and attractive. He gives a short ring on the doorbell of the female pastor Maria. After pushing the button and hearing the bell ring, Vidme leans against the wall and looks at the floor, looks at the doormat of the young female pastor in the Norwegian Church,the one with the beautiful young voice and the beautiful name Maria. Vidme the writer stands there looking at the braided doormat. Vidme the writer stands there looking at the braided doormat of Maria the pastor. And then the door opens. And Vidme sees two bare feet in a pair of brown slippers and then Vidme sees a pair of light blue jeans and then heavy breasts behind a white shirt and then Vidme sees a few strands of blond hair and then a large mop of curly blond hair and then Vidme sees a mouth with thick lips and then Vidme sees two large eyes and then a high forehead. Freed of the claustrophobic first-person narrative of Hertervig, Fosse’s writing becomes almost incantatory. The repetitious circling back of Fosse’s language is still there, but it’s less annoying and more evocative. Somewhat the opposite of Hertervig, Vidme is a man trying hard to reconstruct his ties to the world bit by bit, but always returning to home base just to make sure it is there before venturing once again into an uncertain universe. an armchair that was here when she moved into her furnished apartment, an armchair Maria has no kind of relationship to, an armchair Maria just sits in, it could be any armchair in the world, Maria didn’t buy it because she liked it or because it was cheap or comfortable to sit in. Maria sits in the to her meaningless armchair and she raises her wineglass toward Vidme, but Vidme just sits there staring straight ahead, as if lost in thought, but Maria says skoal! At some point or other in our lives we all discover that we have all landed in a universe, which, it turns out, comes completely furnished. When I was younger this was called an existential crisis. Some people adapt more readily than others to this discovery. Fosse’s characters don’t react well. It’s a pity that Vidme’s story takes up less than one-ninth of the book, because Fosse’s gift is describing the constant inner push-pull of someone who simply cannot decide what he believes in. Vidme reacts to the big questions in life – like faith – with a rush of ambivalent, contradictory thoughts, and it is an absolute pleasure to wander through his mind for the brief moments he is on stage. Because of my interest in W.G. Sebald, I’m likely to read just about anything with the word “melancholy” in the title. But I confess to being slightly puzzled by the use of the term as the title of Fosse’s book. One might be able to claim that Vidme has a good case of melancholy, but he’s a minor character. Hertervig, however, is clearly insane; he’s not depressed or suffering from any of the typical maladies known as melancholy. Melancholy is a translation of Melancholia I. Fosse’s novel Melanchola II has not been translated yet, but a review of it can be found here on the indispensable site The Complete Reader.